When David Whitney traveled to Pakistan to shoot his film about a man forced to flee Afghanistan after falling foul of the Taliban he didn’t expect fiction to turn into reality. But that’s exactly what happened three weeks into shooting political thriller “Kandahar Break” in late 2008. 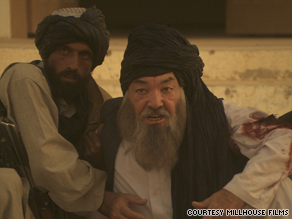 Gunmen attacked the first-time director and his crew near the Afghan border. Four Pakistani crew members were shot and wounded in the incident and the entire crew was forced to flee the region. Pakistani authorities later told Whitney that the gunmen were affiliated with the Taliban and were in fact targeting the Western members of the team. “I was very upset. It was terrifying to know that somebody was trying to attack us, trying to shoot us,” Whitney told CNN. With the help of local security forces the team was immediately evacuated to Islamabad and put on a flight out of the country in 24 hours. Whitney had only managed to film three-quarters of the script and the film’s future lay in the balance. “When I heard that the crew members who had been shot were going to be fine I started to think like the businessman and the producer,” says Whitney. “I thought, ‘How are we going to finish this film We’re not just going to give up.’ And to a man everybody involved agreed to finish it.” After six months spent organizing financial backing, the original cast and crew flew to Tunisia to complete the movie and has been attracting interest from distributors. Despite the danger caused by shooting so close to the actual conflict zone, Whitney says he would shoot in the region again if he had the chance. “Every place you point a camera there’s a great shot. You don’t have to go very far to find fantastic authentic Afghan architecture and beautiful landscapes. “All the people are in the same sort of authentic costumes, so you don’t have the problem of trying to find authenticity — it’s all around you.” Whitney hopes the authenticity will help “Kandahar Break” enjoy the same level of success as Kathryn Bigelow’s “The Hurt Locker” — the first film about the Iraq war to make a profit at the U.S. box office.